The 5th Year Anniversary Limitada wasn’t the only new cigar from E.P. Carrillo (EPC) recently. 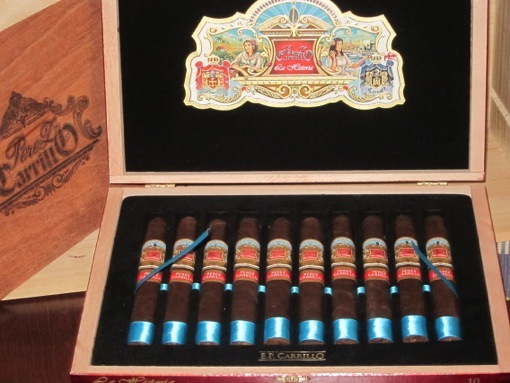 The company also released La Historia, its first box-pressed cigar. While details are murky so far, and while these things have a way of changing, it has been suggested this line will be the first in a new series of EPC of releases called “The Generations” series. The names of La Historia also pay tribute to multiple generations, with the sizes being named after Ernesto Perez-Carrillo’s father, wife, and son, respectively: El Senador, Doña Elena, and E-III. I sampled the Doña Elena (6.1 x 50), smoking four cigars from the ornate box pictured above. La Historia uses a Mexican Maduro wrapper around an Ecuadorian Sumatra binder. According to the EPC website it has only Nicaraguan fillers. However, nearly every retail website (such sites generally get their info directly from the company) lists fillers as coming from both Nicaragua and the Dominican Republic. The cigar comes in a very elegant, ornate presentation. It’s a far cry from the original EPC packaging and it looks very sharp, although the large box isn’t exactly an efficient use of your humidor space for just 10 cigars. Pre-draw, there’s a very unique plastic-like flavor. I thought at first it was from the plastic tray at the bottom of the box, but even the two cigars I set aside for a month had the same element. It’s not something that bothers me, or is even unpleasant, but it’s definitely different. Once lit, you can clearly taste the Mexican wrapper. The cigar produces thick, dense smoke that’s packed with a mix of chalk, milk chocolate, almond, and roasted flavors. The medium- to full-bodied smoke really coats the palate. Construction is flawless. La Historia Doña Elena is a complete 180 from the EPC 5th Anniversary cigar, but good in its own way. All things being equal, I’ve never been a big fan of Mexican wrappers, and this cigar is dominated by it’s wrapper. Yet it’s still easy to appreciate the roasty flavors, voluminous smoke production, and excellent construction. That earns the E.P. Carrillo La Historia Doña Elena a rating of four stogies out of five.